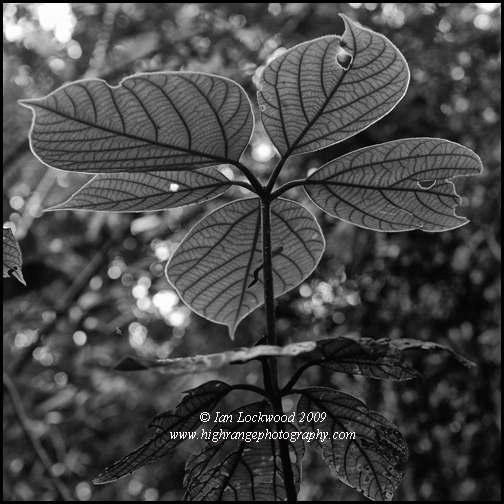 At the end of 2009 I enjoyed four packed days of walking, wildlife encounters and starry nights in Sri Lanka’s incomparable rainforest, Sinharaja. 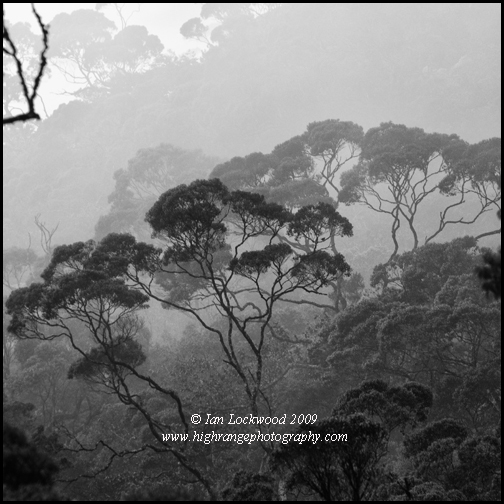 As this blog bears testimony to I have visited the forest at least once or twice every year that we have been here. It continues to provide me with interesting things to photograph and learn about and there is no better classroom for OSC’s students of ecology. This trip was an early Christmas gift from my wife Raina and children Lenny and Amy. I was joined by my colleague and friend Jonathan Smith, who had a similar arrangement from his family. We used the four days to do some serious walking to familiar places as well as the more distant Sinhagala peak (742 m). This peak sits amidst the heart of Sinharaja’s least disturbed lowland rainforest. The walk there and back takes 5-6 hours but it is a pure delight as you go deeper into the forest’s interiors. There were no other hikers, though signs of elephants made our guide Ratnasiri jittery for parts of the trail. 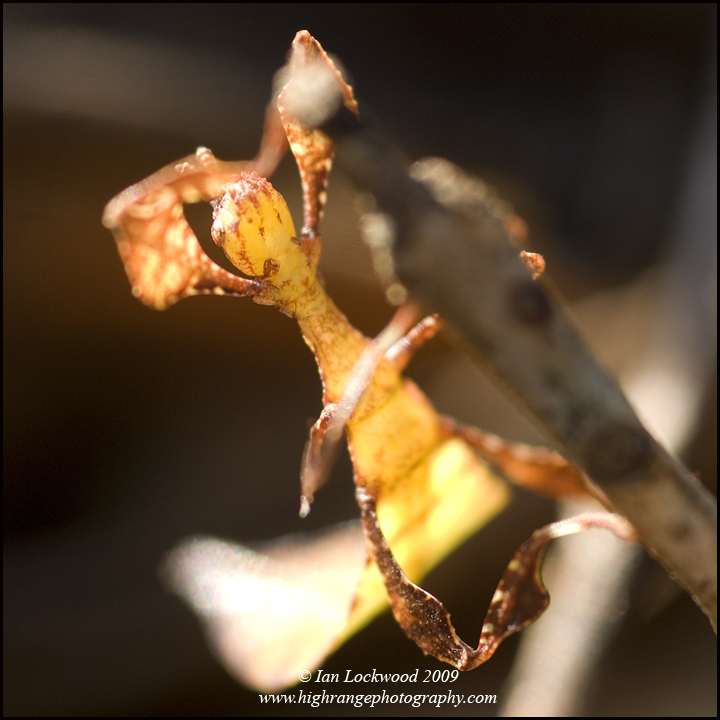 Along the way there were numerous living treasures to observe and photograph. The summit (actually a rock face) view with about 250 degrees of rainforest canopy, is worth all the sweat and large numbers of leaches that await visitors. On our last day we hiked up Moulawella peak (760 m) in the dark and witnessed the birth of a new day from its boulder summit. The views north towards Sri Pada were particularly impressive. Its temple lights glowed in the inky darkness amidst the glitter of celestial bodies. Below us the forest awoke in a cacophony of delightful sounds. I clearly heard the sound of a whistling, similar to that of the Malabar Whistling Thrush that I know well from the Western Ghats. I couldn’t help wondering if it was the elusive Arrenga or Sri Lankan Whistling Thrush (Myophonus blighi) that is found at higher altitudes in the Central Highlands. With fours days in the forest we did quite well with endemic wildlife sightings. 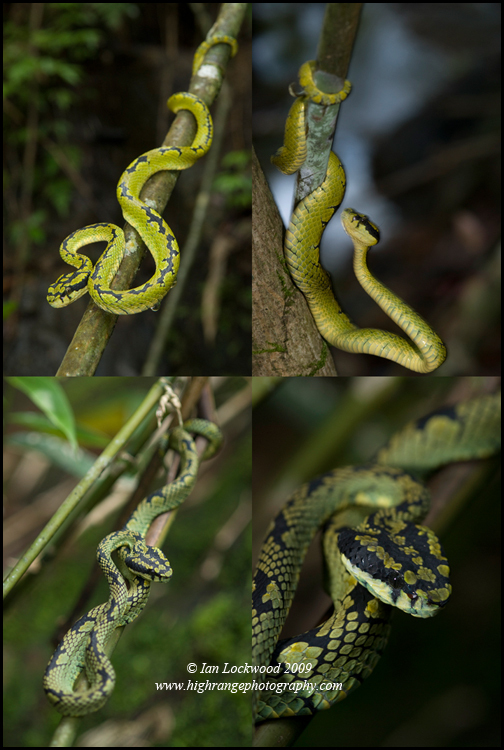 Two Green Pit Vipers (Trimeresurus trigonocephalus) were an early highlight. They were very cooperative with us while we fiddled with lenses and flashes and I set up the cumbersome Hasselblad with extension tubes. 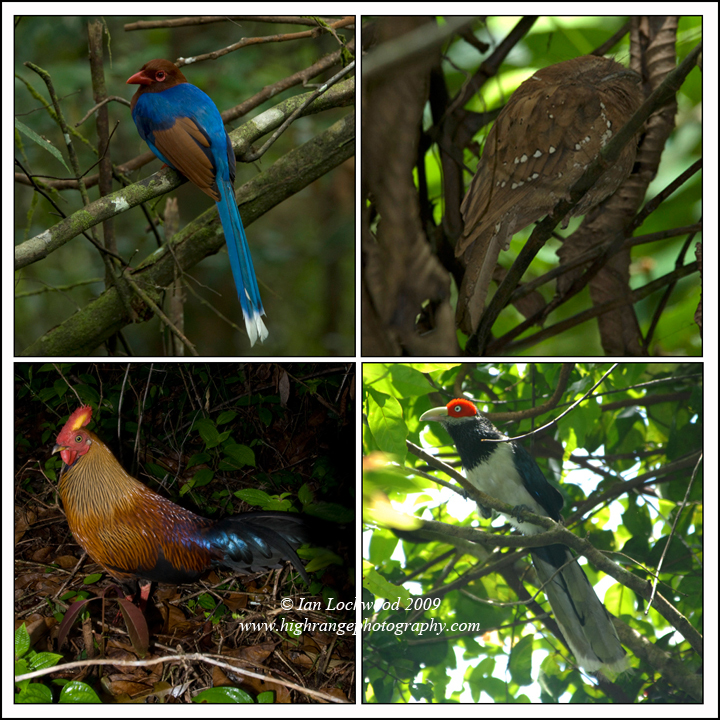 We encountered many of the endemics birds that Sinharaja is so well known for. SL Blue Magpies (Urocissa ornata) are becoming very habituated to people at the research center and of course Martin has a special relationship with them at his place (they arrive regularly every morning before breakfast). We had a good view of a sleeping Ceylon Frogmouth (Batrachostomus moniliger), which I haven’t seen in 10 years! 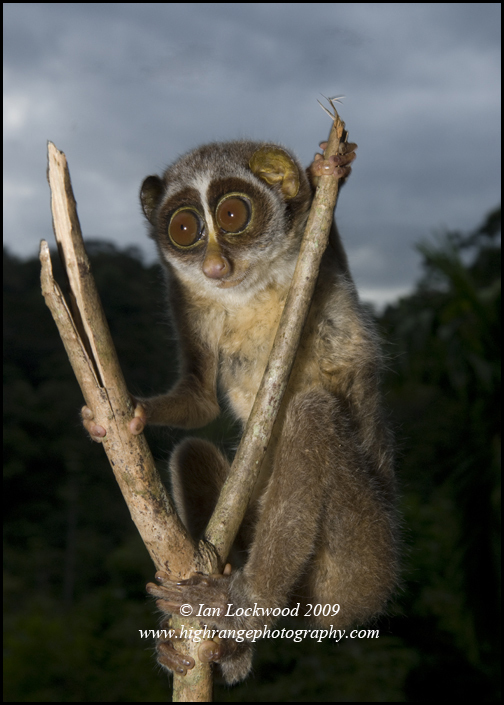 Finally two research scientists with Colombo University shared a rare Red Slender Loris (Loris tardigradus) that they had caught and were measuring for taxonomical reasons before releasing it back into the forest. We left Sinharaja appreciating the work of past generations of Sri Lankan conservationists who saved the forest from ending up in wood pulp. It is a story i of successful grassroots activism and persistence from concerned citizens and scientists. Perhaps most reassuring is the impressive forest recovery that has happened in areas that were once clear-felled by the logging operation. It has been so effective such that most visitors are unaware of what a disaster it could have been. Sri Pada's eastern face set amidst the sub-montane forest of Peak Wilderness. 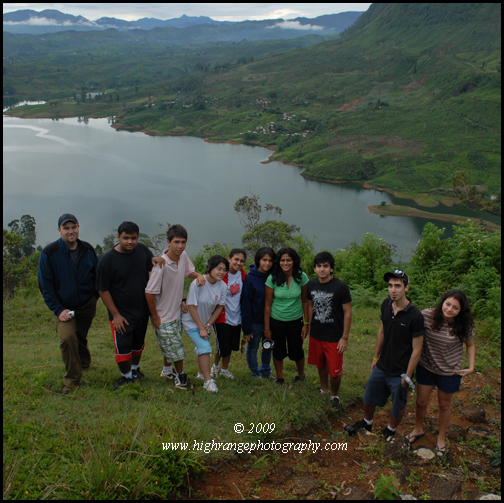 Every winter just before the first school semester draws to a close I have the privilege of taking my grade 11 IB Environmental Systems & Societies class for a three-day field trip to the Peak Wilderness Sanctuary in Sri Lanka’s Central Highlands. The aim of the trip is to expose students to natural as well as human-impacted ecosystems in the Sri Pada (Adam’s Peak) area. Much time is spent getting there and back but it remains a key learning experience for our students. We spend most of our time looking at issues of vertical zonation in sub-montane and montane (cloud) forest. We mapped our track and are now working on a GIS generated map of the area’s vegetation (along with contour lines etc.). I have the students focus on plants but we also take note of birds, reptiles and amphibians that we come across. The trip is designed for exposure rather than hard data gathering (something that they will do in Sinharaja in May). As usual we stayed at the Maskeliya Estate Fishing Hut bungalow. It offers few creature comforts but is an ideal site for a field study and is set on the boundary between the vast tea estate and undisturbed montane forest. This year I took eleven enthusiastic students, many who had been in my grade 10 Geography class which did a field trip to Horton Plains National Park. Of the three Sri Lankan students none had been to this sacred mountain before! Our second day was spent climbing up slowly through the montane and then cloud forest to the summit of Sri Pada (2,243 m). I had a unique and unusual experience of meeting a Buddhist monk from Chittagong (Bangladesh) on the way up. We enjoyed a lengthy discussion in Bangla as we completed the last steps and arrived at the temple mid day! These pictures (all digital) were taken on the trip. With the class above Maskeliya . Kirigalpotha, Sri Lanka's 2nd highest peak located in Horton Plains National Park is the pyramid on the distant horizon. Maskeliya Lake looking east towards Horton Plains National Park. The waterfalls is "Adam's Peak Falls" although it does not actually originate on the peak! 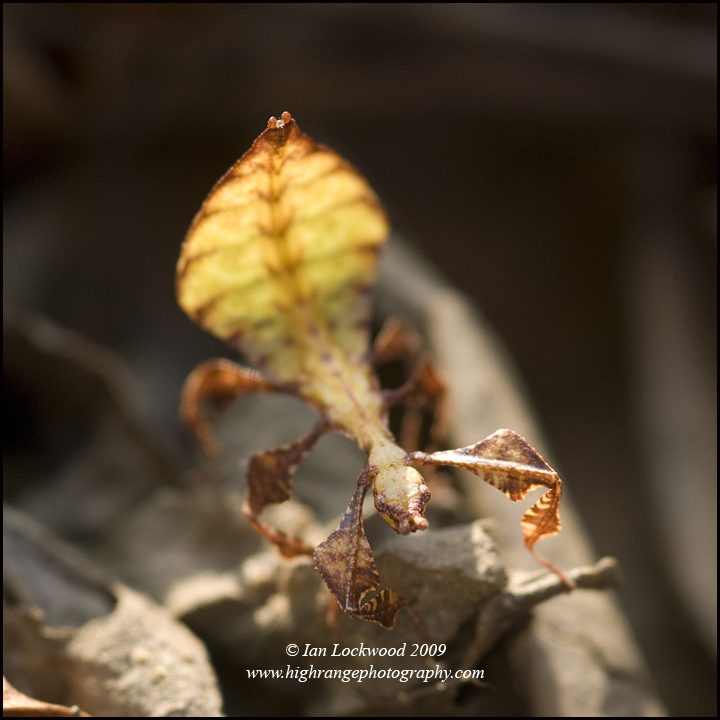 Thanks to my OSC colleague Haris Dharmasiri we are once again raising leaf insects at home. The eggs in my batch started hatching out in late November and these pictures were taken in the first few days of their life cycle with natural light. As per their dietary preferences they are feeding on guava (Psidium guajava) leaves. 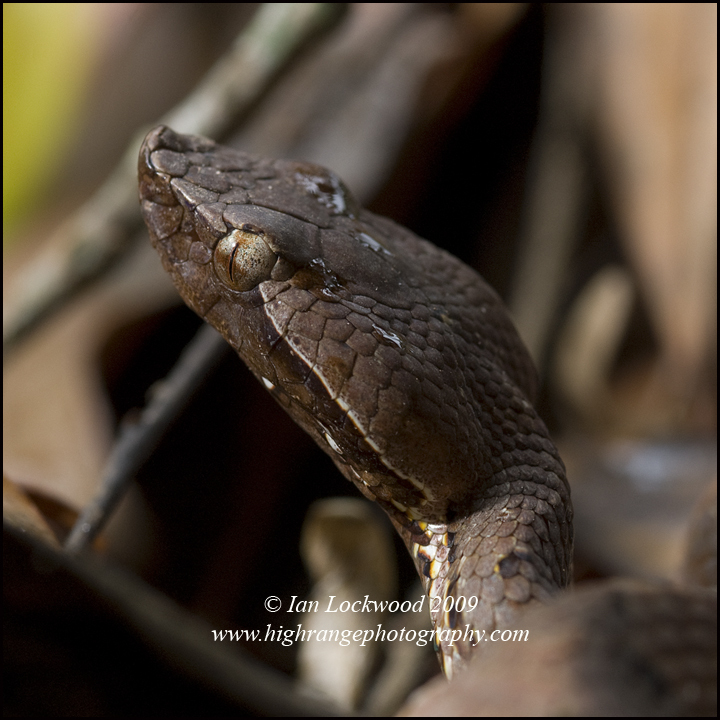 Hump nosed viper (Hypnale hypnale) in a Colombo suburb. 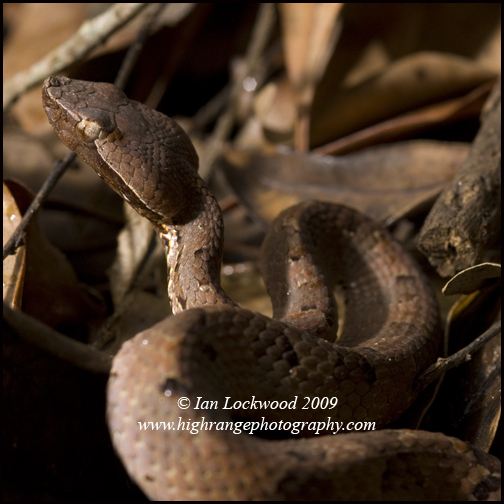 The Hump Nosed Pit Viper (Hypnale hypnale) (Sinhalese polon thelissa, Tamil Kopi viriyan) is a small, venomous snake found in woodlands across the island. This one was found in our neighbor’s house and has spent a few weeks with us in November as a family pet. I released it into the next-door lot after photographing in various lighting conditions. 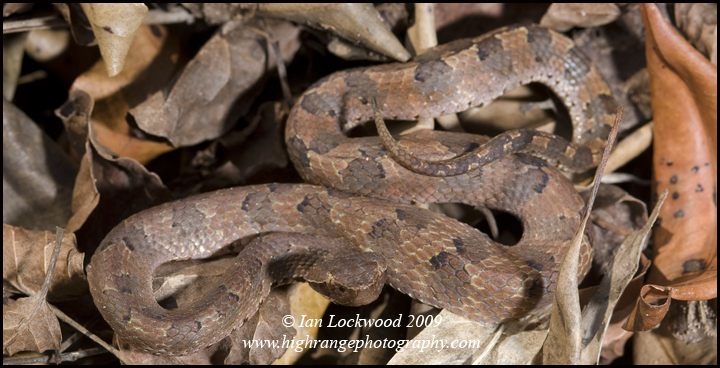 There are two other Hypnale species found in Sri Lanka, but these are quite a bit harder to find. Hump nosed viper (Hypnale hypnale) whole body. Hump nosed viper (Hypnale hypnale) close.